This is the mini-conjunction I've been seeing around Jupiter. I took this photo through the telescope, and adjusted the orientation to match what would be seen through binoculars. In my binoculars (9x63) I saw a triangle made by Jupiter, the star, and the right-most moon. It should go without saying that the whole scene looks quite crisper than this photo, which is a blurry shot taken with the camera held up quickly to the eyepiece. Well worth checking out; the moons are constantly shifting, so no two conjunctions will be alike. 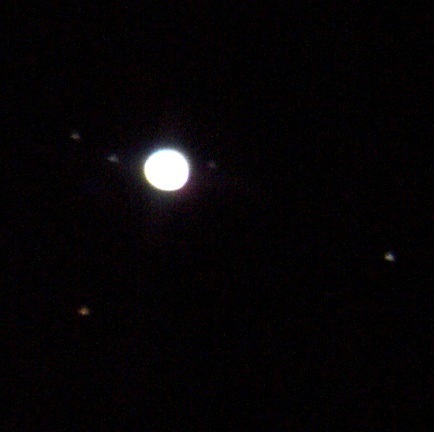 From left to right, the moons are Io, Europa, Callisto, and Ganymede. The star to the lower left is Nu Librae, or SAO 159028. Photo taken March 2 at 3:21 a.m., New York time. This past Saturday, I took my family to the local planetarium at the HR MacMillan Space Centre in Vancouver, BC, Canada. We were instantly turned on to the stars! While we were there, we bought a Starry Nights CD (Galaxy Explorer?) and within minutes of arriving home, we were spotting objects like Mars. To newbies like us, it was pretty exciting. I stumbled across your blog today while searching for information about astro binoculars. Can you recommend a good quality, yet inexpensive, model of binocular (or perhaps I need a telescope?) that would be suitable for seeing a bit of interesting detail on objects like Jupiter, Mars and our moon? Congratulations on finding astronomy. I would say start off with binoculars and try astronomy for a while before you buy a telescope. After a time watching the skies with binoculars, you'll have an easier time deciding what telescope to buy, and also how to use it. That is the universal advice for beginners, but you can believe me, it's good advice. I have a 9x63 pair of binoculars from www.meade.com which is fantastic for picking up details on the moon and lots of stars; just keep in mind that it's a bit heavy, and the best way to buy anything is to try it out in a store first (or at a star party). An excellent site for astronomy basics and telescope info is http://skyandtelescope.com/. For a wide variety of opinions, you can drop by http://www.bautforum.com/ and ask questions in the Astronomical Observing forum.